Guests of the Democratic National Convention media party got a Philadelphia welcome Saturday at Citizens Bank Park. PHILADELPHIA (WPVI) -- Guests of the Democratic National Convention media party got a Philadelphia welcome Saturday at Citizens Bank Park. Philly legend lookalikes and mascots greeted journalists and crew members from across the country. Inside, some walked the bases. Dozens of local businesses served up specialties, including a new spin on a Philadelphia tradition. "They're like salmon cheesesteaks, and when they take it they're like mmmm," said Haneef Ali, Chef Haneef Ali's Kitchen. Besides media, thousands of delegates, party officials and others are expected to descend on Philadelphia this week for the official nomination of Hillary Clinton. A convention former Pennsylvania Gov. Ed Rendell expects to be different than the Republicans. "I think it will be a message that will hope to bring the country together, rather than divide it," said Rendell. 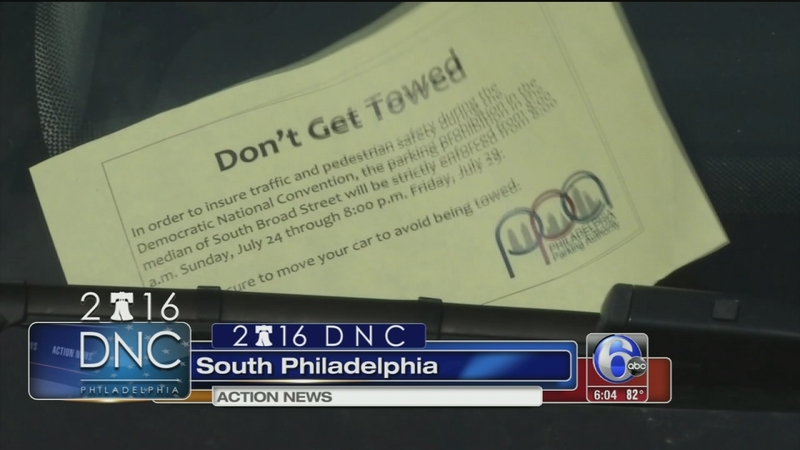 The convention brings its share of inconveniences, including a parking ban along the center median on South Broad Street. Police will begin towing cars at 8 a.m. Sunday. As security officials ensure the venue is ready for the Democratic National Convention, city officials are making sure the city is also ready, and that includes towing and road closures. "The inconvenience will not be anywhere near what the pope was so this is like four Eagles games in a row," said Mayor Jim Kenney. "It's about the same amount of people we're dealing with." But some in South Philadelphia are more concerned about the row of state flags recently hung on South Broad Street. Some are calling on city leaders to remove Mississippi's flag, which includes the stars and bars seen on the confederate flag. "They could hang a United States flag there. They could hang a Pennsylvania state flag there," said Patrice Jeppson of South Philadelphia. "It would be a statement of the city to Mississippi."